Members of the North Country Alliance for Public Education want parents to refuse to allow their children to take the upcoming Common Core tests in New York State. New York lawmakers are considering placing a moratorium on the controversial Common Core as part of the state budget. But tests under the standardized system begin April 1st. New York’s Common Core tests not only measure student progress, but are also markers for school and teacher progress. Dr. Margarita Garcia-Notario is president of Stafford Middle School Family School Organization. She is also active with the North Country Alliance for Public Education, which is calling on parents to refuse to allow their children to take the tests. Calls to the NYS Education Department were not returned. 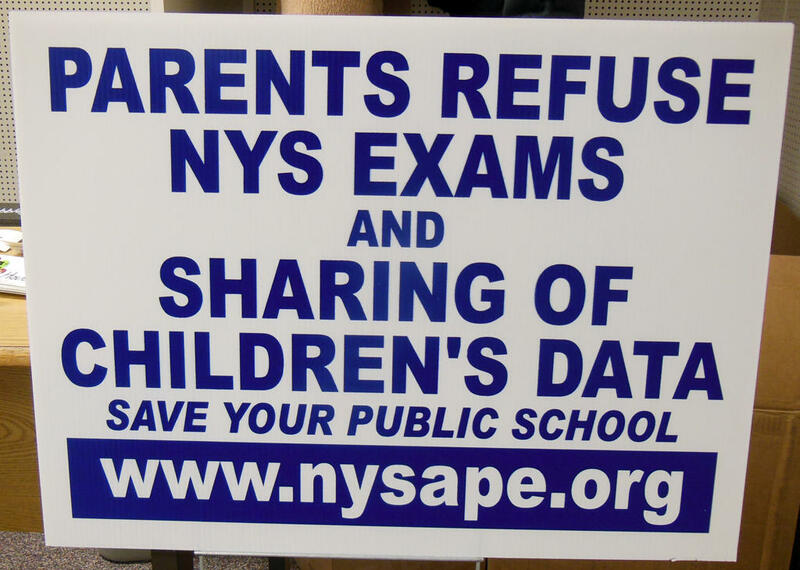 The North Country Alliance for Public Education is offering lawn signs to promote parental refusal of Common Core exams. NYS Commissioner of Education Dr. John King delivered his state of education address Thursday night in Troy, answering some questions about the controversial implementation of the Common Core. As part of the 4th Annual Esteves School Education Speaker Series at the Sage College, New York State Commissioner of Education Dr. John King spoke before a crowd of undergraduate, graduate and doctoral students. The Common Core standards. That's really all you have to say to get an animated discussion going...and by that I mean an argument. Though the standards were adopted by almost all the states, there is now a good deal of push back against them. The North Country Alliance for Public Education held a forum on the progress of implementation of New York’s Common Core education standards last night. The meeting was intended to update the public about emerging information on the standardized test controversy. New York State Senate Republicans say they will break a longstanding tradition of boycotting the election of new Regents. They now say they will attend a joint legislative session, and that many will vote no over dissatisfaction with the Common Core. It’s uncertain whether all four of the incumbent Regents members will be reelected. WAMC's Dr. Alan Chartock discusses the upcoming snowstorm, the New York Board of Regents, and common core.